Why aren't our Car Covers 'Waterproof'? It seems like that should be an obvious conclusion - that an outdoor can cover should be waterproof. But actually, that would be TERRIBLE for your car, truck, or SUV! All materials from Coverking, who make our outdoor car covers, are breathable – this allows moisture which is trapped under the car to escape through the cover, preventing a “greenhouse” condition. That's what you would get with waterproof materials - condensation under the cover which may result in damage to your vehicle. That moisture will stay trapped under the cover and cause bacteria to grow more rapidly and eventually lead to oxidation and rust. We're talking about hundreds of dollars to repair. 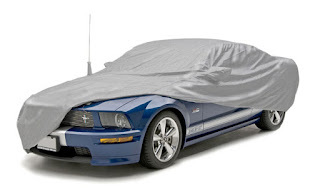 So beware of covers that claim to be waterproof – a waterproof car cover can damage your vehicle. A car cover should be water resistant, to keep the vehicle from getting wet from dew or moisture, but not waterproof (or rainproof). CLICK HERE to see our complete line of Car Covers for any situation or location! We highly recommend using KATZKIN LEATHER LOTION available on ShopSAR.com for regular conditioning of your seats to keep them looking new for years to come!